Stuff your stocking with I Love..., Burt's Bees and The Body Shop! 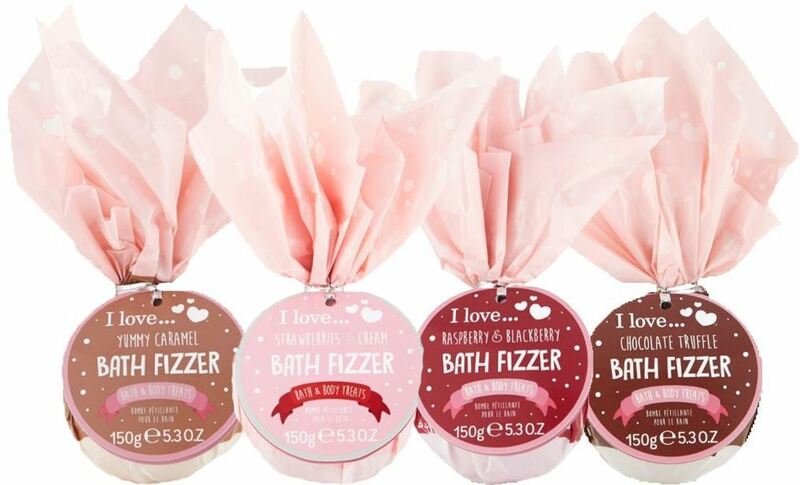 I Love... Bath Fizzer - 150g - $4.99 - in four scents: Chocolate Truffle, Yummy Caramel, Raspberry Blackberry, Strawberry Cream - drop in a warm bath for fizzing and bubbling delicious scented goodness. Burt's Bees Mistletoe Kiss - $9.99 - includes three lip care essentials with natural ingredients that condition the lips: Pomegranate Lip Balm - infused with antioxidant rich pomegranate oil to for smooth and even-toned lips; Hibiscus Tinted Lip Balm - enriched with nourishing shea butter and a sheer touch of colour for eight hours of moisture in a hue inspired by nature; and Peony Lip Shimmer - combines sheer pearlescent shine and the nourishing powers of sunflower oil to smooth, hydrate and condition the lips. Available at grocery, drug and mass retailers across Canada. The Body Shop Duck N Dive - $18 - includes three fruity 60ml shower gels in Strawberry, Coconut and Mango along with a super-cute bath duck. As an added bonus, when you buy this gift, it will help fund the Peace Play Project in Lebanon for a year, providing play and activities in a safe place for Syrian refugee children.